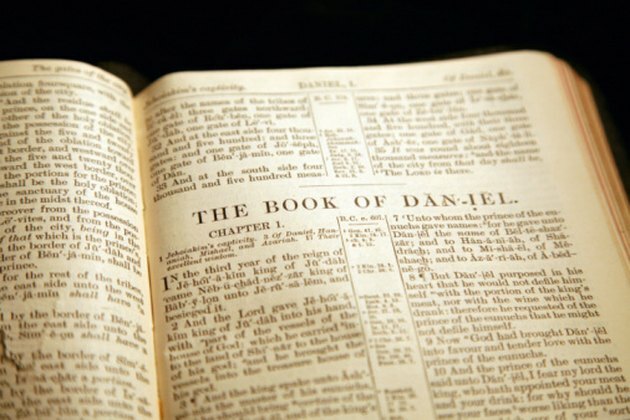 The Daniel Fast is based on the fast of Daniel and his companions in the book of Daniel in the bible. It can last 3, 7, 10 or 21 days, depending on the purpose of the fast and your preferences. This is a partial fast in which foods such as fresh fruits and vegetables, whole grains, nuts, legumes and seeds are eaten as close to their natural state as possible. Some foods are strictly forbidden on the Daniel Fast. It is advisable to consult with a health care professional before committing to any fast including the Daniel Fast. On the Daniel Fast, no meat is allowed; however, some people following the fast do eat fish and seafood as a source of protein. The forbidden meat includes chicken, beef, lamb, pork, eggs, turkey, veal and other game meats. Dairy products are also forbidden because they come from cattle. While whole grains, such as brown rice or barley, are allowed on the Daniel Fast, any leavened breads are forbidden. Bread, baked goods and any foods containing white rice or white flour are off limits. When you are choosing whole grains, be sure that you don't choose any that contain sweeteners like honey. You should avoid caffeinated beverages, sweetened beverages, tea -- even herbal tea -- and energy drinks while on the Daniel Fast. Additionally, milk is off limits. Any beverages you drink mustn't have any added flavorings, especially artificial flavorings. Fried foods, foods with additives, solid fats like margarine and processed foods are all forbidden on the Daniel Fast. Because of this, you must carefully read all food labels to determine if foods meet these specifications. Spices, seasonings and salt are also forbidden on the fast. However, specific churches may recommend variations to the Daniel Fast and as such, you may want to discuss it with your pastor or an elder. Can I Eat Oatmeal on the Daniel Fast?